Entertainment live – from a very special perspective. The World Dinner Restaurant is accessible for anyone holding a regular event ticket. As an alternative to the Premium All-Inclusive-Package, we suggest a Premium Seat ticket combined with a visit to our World Dinner Restaurant. 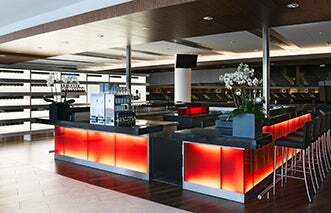 It is located on the Entertainment Suite level (level 3) and has a capacity of over 450 people. At center stage shows and sports events, the World Dinner Restaurant offers a superb view of the inner bowl. The "Dine & View” offer is particularly popular at Eisbären and ALBA BERLIN games as the restaurant is located directly above the fan area - the perfect spot to experience the sweeping atmosphere during the game. The balcony of the World Dinner Restaurant is equipped with 72 bar stools and 17 tables for four people with a total capacity of 144 seats, providing perfect sightlines to the rink. These seats can be booked as a regular seat at events with a center stage. Depending on the event, an à la carte menu or a buffet is available or included.